Just 20 minutes north of the Kona International Airport, this Vista Waikoloa condominium is located in the Waikoloa Beach Resort. The beautiful, crescent-shaped, white, sand beach, 'Anaeho'omalu Bay, is just a short walk away and is great for relaxing or enjoying a wide variety of water sports. Your immediate neighbors are some of Hawaii's finest hotels (Waikoloa Marriott and the Hilton Waikoloa), condominiums, and golf courses. The Kings' Shops and the Queens' Marketplace, which are only a short walk from your vacation home, provide the largest selection of one-stop shopping, dining, and entertainment experiences on the Kohala Coast. Waikoloa Beach Resort features two championship golf courses and excellent tennis courts for the tennis buff. Within a ten-minute drive, you can find additional premier golf courses as well as the island's best beaches. The Vista Waikoloa is known for being one of the best built condo complexes on the Kohala Coast with steel and concrete construction, spacious lanais and a fabulous pool area. This unit is on the first floor and has a beautiful garden setting. The heated swimming pool, which is nearby, is large enough to appeal to the fitness lap swimmer. There are also two whirlpools, changing rooms, and plenty of space for just relaxing and getting a golden tan. There is a reserved parking space for your rental car and a security gate on the property. Upon arrival to this condominium, you are sure to find all of the amenities of luxury resort living. Who wouldn't want to live in Paradise? 52 inch TV in living room. The property was as advertised. Very well-furnished, clean and comfortable. I was especially impressed with the kitchen - very well stocked with cooking equipment, spices and condiments. The location was excellent - easy access to the beach and restaurants. The owner responded immediately when we had a problem with a broken faucet and if was fixed that day. A very good experience. It was a pleasure to accommodate your party. Thank you for the great review and I welcome your return. This beautifully appointed condo is walking distance to A-Bay, the fabulous beach fronting the Marriott and Lava Lava Club, the Hilton Waikoloa Village, petroglyph walking trails, the Kings shops, and Queens marketplace. It’s all here. We almost didn’t need a car. The Marriott beach rents kayaks, SUPs, Aqua bikes, and offers snorkel, whale and dinner cruises on a huge catamaran. The condo itself is large, comfortable and has every amenity you can imagine, including beach towels, boogie boards, snorkeling gear, and insulated beach bags. 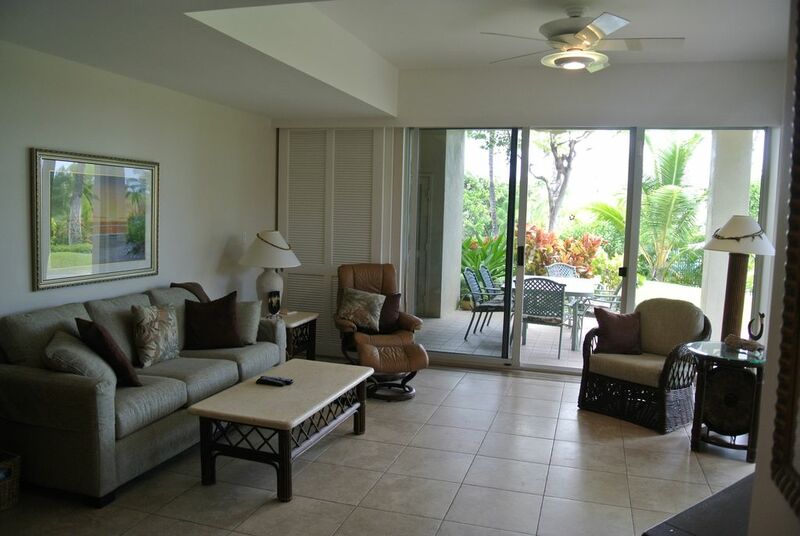 The lanais are private with greenery surrounding and a few steps from the outstanding lap pool and hot tubs. A few steps out the front door is a first class gym with free weights, new cardio equipment and more. We used the gym almost daily. The kitchen is perfectly appointed - we cooked every day. The nearby Island Gourmet in the Queen’s marketplace is an outstanding grocery store and also carries prepared mixed plates, sushi and more. There is a nice selection of island travel guides at the condo, also Hawaiian CDs, yoga DVDs and a few movies. The bed in the master bedroom was really comfortable, and the bathroom with walk-in shower was great. We spoke with Helen, the owner, once, and she was very helpful and friendly. We will definitely be back! Would definitely love to have you back! Thank you for the glowing review. Yes, this is indeed a little piece of paradise and I love to share it with special people like you! Outstanding. Can't ask for more. We'll ber back! We love the Big Island and this is the perfect place to enjoy it. Unit C104 in Vista Waikoloa was great! Nice place, well stocked with all the kitchen things you'll need and the HEATED POOL was literally 30 steps from the lanai! Plenty of towels and all the other necessary things. No problems with the unit at all. And working with the owner, Helen was a true pleasure. So happy you had a most enjoyable stay! Thank you for the many positive comments. Thank you Michael and Carolyn. I welcome your return. Aloha! First visit to this island; we really enjoyed everything about it. We had a great, relaxing holiday as this condo is exactly what it described!!! Thanks for expanding a dream even more to have longer visits in the future! Very nice place. This unit has what you need to be self sufficient while on vacation. Not much is needed except your own personal items. The kitchen has pots and pans, appliances are updated and well maintained. The only item in the kitchen I felt needed to be updated was the cutlery. The unit has great access to the pool, common area and the exercise room. Many thanks for your honest review. You will be pleased to know that it was and is my intention to replace the cutlery when I return next month. So happy that you enjoyed your stay. Kindest regards.